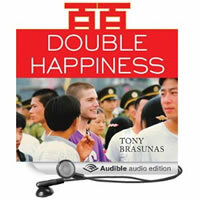 To celebrate the fresh Springtime air, the new design of this website, and the launch of the audiobook of Double Happiness, I’m having some fun and giving away copies of the audiobook. Comment on a recent entry in this blog. Tell me something you like, give me design feedback, or just say hi. (If you’re having trouble commenting, send me an email). Like the book on Facebook and share one blog entry on Facebook by clicking on the “share” icon below an entry. That’s it! Two little things that let me know you’re out there, and I get to share the audiobook with you for free. If you’re not on Facebook, you can send out an email to your community. If you’re one of many who prefer to hear a story rather than read it, if that’s more pleasurable or convenient for you, or if you would simply like to hear my story in my own voice, give the audiobook a try. I’ll send it to you — a code and instructions to get set up. That’s a $29.95 value. If all eight giveaway copies have already been given away, I’ll mention that here, so you’ll know. 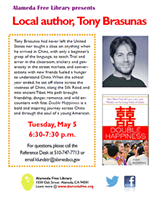 Delighted to announce I’ll be reading from Double Happiness at the Alameda Free Library on Tuesday evening, May 5. If we translate “Cinco de Mayo!” into Chinese we have “Wu yue wu hao!” There will be celebrations, festivities, and a surprise giveaway. The library is doing an “Armchair Travel” reading series, and I’ve been asked to read as the closing event of the series. So although I thought my final two events were the two Bay Area events in January, here’s another chance to get a taste of Double Happiness and to meet me at an event. I’d love to see you there! The book is out. The hardcover, paperback, e-book, and even audiobook are now in the world, taking adventurers and armchair travelers on rugged journeys to China. It’s time for this blog to shift slightly in focus. While still offering occasional updates on the publication of Double Happiness, and sharing my thoughts on the ever-changing world of writing and independent publishing, I’ll also be offering my thoughts on China, travel in general, and the inner life of learning and happiness I’ve been leading since coming back from China. And maybe some other topics too, if the inspiration strikes. The old layout and design served me well for many years. Now it’s time for something new. 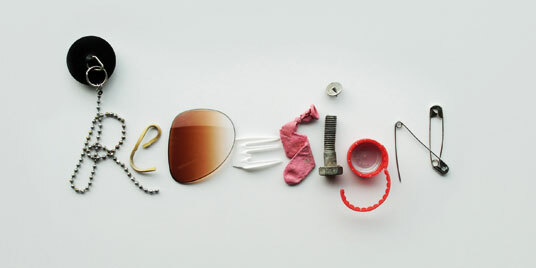 In one of my lives I’m a software engineer and web designer. Let me know your thoughts on this new design. Try out the revamped comments section below.